On Sunday I was on the Munro, An Coileachan, the eastern-most of the Fannaichs range in the northwest Highlands. It was such a contrast to the same time last year as shown in the photo below. 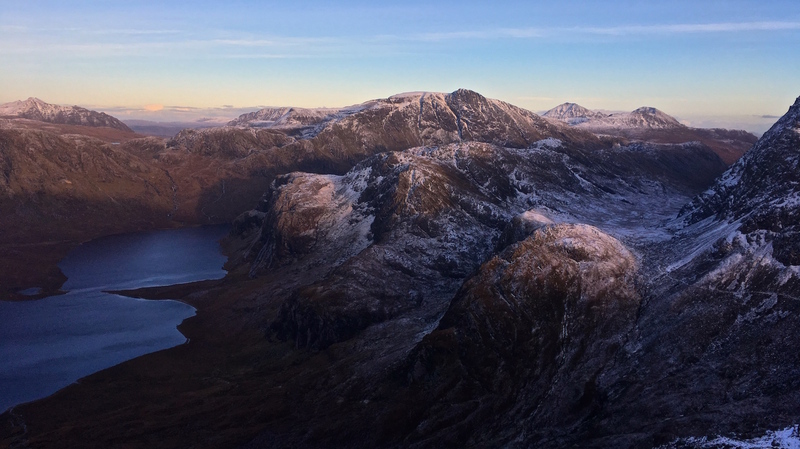 This photo shows the view from Am Faochagach looking southwest to the Fannaichs on the 7th January 2017. It was comfortably above freezing at 900m and the hills were almost devoid of snow. Fannaichs in January 2017 – not much snow! Fast forward to the 7th of January 2018. Full-on winter conditions prevailed in the hills with the temperature hovering around -7C at the road when I started walking. The surface of Loch Glascarnoch, a large reservoir nearby, was almost entirely frozen over. I followed the river southwards towards the hills taking advantage of the frozen bogs making for easier walking than is usually the case. The conditions were glorious with clear skies, light winds and the moon still visible in the sky. The weather stayed good for the day although the southwesterly wind did pick up a bit in the afternoon with a blanket of high level cloud cover filling in. The summits remained clear though and it was definitely one of the best days of winter weather we’ve had recently. I made good progress on my walk-in until I started to climb above the 400m mark. Here a breakable icy crust interspersed with deep drifts amongst peat hags made walking difficult and tiring. I don’t think there can really be an easy way to travel in those snow conditions. I stumbled along, eventually reaching the col between the minor top of Meallan Buidhe and An Coileachan. It was a relief to see more scoured slopes above me. After a quick break I plodded on and reached the summit at 1230. This was perfect timing for a lunch break and with amazing views in all directions! I found a sheltered spot to take in the view and admire the amazing rime formations that had built up on the summit rocks. I have my Winter Mountain Leader assessment before the end of the month and so the temptation to do further Munros after lunch was ignored. I headed off west and found a suitable area of snow to practice some of the skills I’ll need to demonstrate. An hour of digging in snow ensued! Although the digging is hard work its a fun way to spend the time and also gave me a chance to look at the snowpack in a bit more detail. There was certainly plenty of windslab around. Once I was satisfied I had practied all that I wanted to, and with time marching on I decided to head back down. I broadly followed my route of ascent with a few detours to try and find easier walking conditions. I was moderately successful but was still glad to reach the firmer lower slopes once more. As I walked back the views north to the Beinn Dearg group dominated the view, giving me some inspiration for future adventures. Let’s hope the snow hangs around for a while yet! If this is an area that you would like to explore, take a look at my forthcoming trip on the 2nd/3rd June.